It is considered the second highest skyscraper in the world with a height of 602 m.
It consists of 10970 accommodations and 259 elevators as well Mecca Clock. It is located opposite to the Holy Haram, 500 m far from Holy Kaaba. It is known as endowment of King Abdul Aziz Bin Abdul Rahman Bin Faisal Al Saud that is subordinate to the Holy Haram. 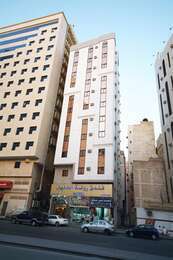 Tower Hotel: It is considered the highest tower among Abraj Al Bait. It is established in 2010 and consists of 60 floors. It contains Fairmont Hotel‬‬ which includes 1930 accommodations and 50 elevators. In additions, the last floor of the tower is assigned for establishing The Custodian of the Two Mosques Abdullah Bin Abdulaziz Center for Crescent Observation and Astronomy. Maqam Tower: It is consisted of 48 floors and established in 2010. It contains Swissotel Makkah Hotel and 1750 accommodations as well as 40 elevators and landing strip. Qibla Tower: It is consisted of 45 floors and its establishment started in 2009 and finished in 2010. It includes 1690 accommodations and 38 elevators as well as landing strip. Hajar Tower : It is consisted of 37 floors and established in 2009. It includes Movenpick Hotel and 1700 accommodations as well as 36 elevators.Zamzam Tower: It is consisted of 35 floors and established in 2007. It include Grand Zamzam Hotel and 1750 accommodations as well as 41 elevators. Marwa Tower : It is consisted of 29 floors and established in 2009. It includes Al Marwa Rayhaan by Rotana and 1200 accommodations as well as 27 elevators. Al Safa Tower: It is consisted of 28 floors and established in 2010. It includes Raffles Makkah Palace Hotel and 950 accommodations as well as 27 elevators.